The Purchasing Index shows significant weakness with the index falling from a reading of 40.1 to 34.9. The consensus expectation was for IMPROVEMENT to 42! Any reading below 50 shows CONTRACTION and 34.9 shows extreme contraction. Here are the details of the report from Econoday. 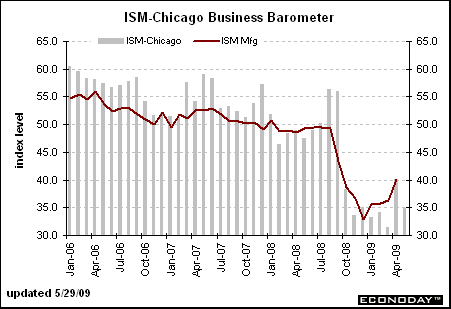 A “W” recession is what the Chicago purchasers report is pointing to as the headline index came in at a much weaker-than-expected 34.9, a reading well below 50 to indicate significant month-to-month contraction in business activity. New orders, always the key index, fell nearly 5 points to 37.3. Backlog orders fell nearly 11 points to a very depressed 26.3. Businesses, facing declining orders, continue to draw down inventories as much as possible with the index at 31.5. Job cuts are deeper than ever with the employment index down nearly 7 points to 25.0. Despite increases in energy and commodity prices, purchasers continue to report significant month-to-month declines in input prices with the index at 29.8. This report has a thin sample and a sample that includes both manufacturers and non-manufacturers. But its results are clear and do point to disappointing reversals in next week’s national purchaser reports from the ISM. Stocks fell back in immediate reaction to today’s report. Backlog orders falling does not indicate future growth, that’s for certain. Sorry, but I just fail to see any of the supposed greenshoots that everyone is so enamored with. I see printing, buying our own debt, buying up failed businesses (but not yours), and false profits in the financial space.